The Institute for Advanced Composites Manufacturing Innovation is addressing the shortage of skilled workers. At the heart of Purdue’s research and education efforts is the role the University plays in equipping the future leaders and skilled workforce in advanced manufacturing. 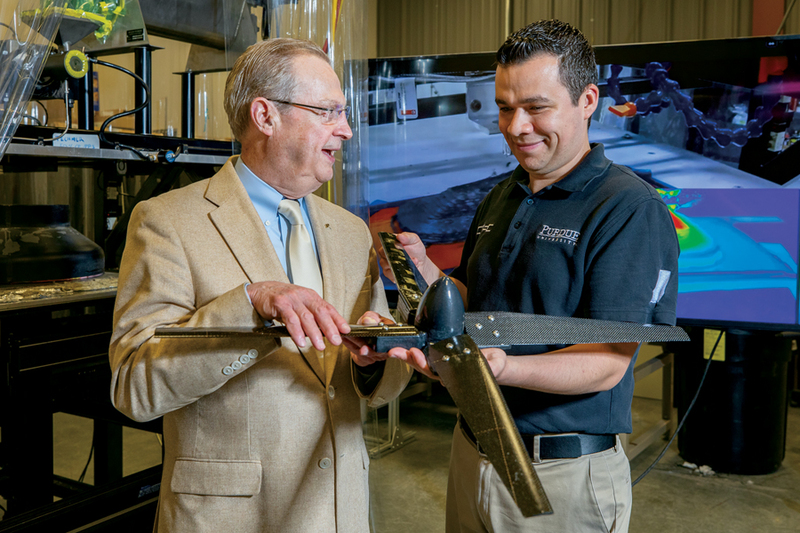 “If you want to have a significant impact as a land-grant university, you need a vision to translate the discoveries in the research laboratory to the marketplace, particularly in manufacturing,” says R. Byron Pipes, the John L. Bray Distinguished Professor of Engineering and executive director of the Composites Manufacturing and Simulation Center (CMSC). The center is based within the $50 million Indiana Manufacturing Institute in Purdue Research Park, opened in 2016, where it shares space with the Indiana Next-Generation Manufacturing Competitiveness Center, as well as other public and private organizations with related missions.